Superman and Batman continue their argument about whether or not to chase after Brainiac and the stolen Daily Planet building or to focus the fight on Earth itself. But before they can agree one way or the other, Brainiac's robots and exobytes attack the JLA watchtower, breaching the hull on several decks. The Justice League splits up to deal with each breach separately. The exobytes take over Aquaman and begin digitally downloading his powers, but Superman manages to freeze him with his super breath before he dies. The robots manage to see through the Martian Manhunter's invisibility and download his powers as well. 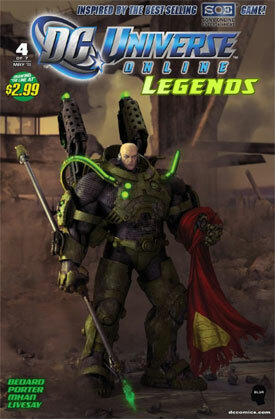 Luthor and his team of surviving heroes and villains prepare their attack on Brainiac's mothership. Luthor, Atom and Black Canary approach the ship directly while the others prepare a ground assault to keep the enemy robots busy. Luthor intends to find a shrunken bottle city from the planet Korugar so he can find a Sinestro Corps ring and use it to finish off Brainiac. Once the attack begins, Atom tries to shut down Brainiac's robots, which causes an explosion that takes his right arm completely off and destroys the remote device that Luthor gave him to shut down his armor. Brainiac discovers that Luthor, Atom and Black Canary are on his mothership and prepares a counter attack. Story - 3: This was the big, action-packed fighting issue. Since the whole point of the DC Universe Online game is to change this future, it allows the story to go in directions that regular continuity can't. Any character can be maimed or killed, except for Luthor of course. Then in the present, anyone who isn't in the future or the final battle from the opening game video can be killed. Aquaman, Martian Manhunter and everyone in the Daily Planet building is in legitimate danger. In the regular Superman books, we know that Lois Lane is never in any serious danger because she won't die and become permanently removed from future stories. In this one, she's actually likely to die at some point. The suspense isn't so much "will characters die?" but rather "When and how will they die?" Although I didn't mention it in the recap, I especially liked when The Flash took Brainiac's robots apart with a wrench at super-speed in the present story. 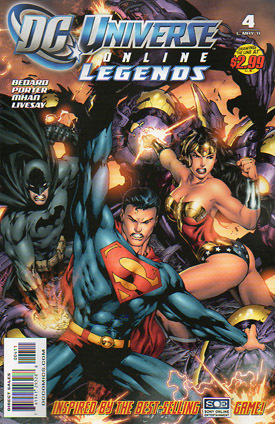 Art - 3: The art is consistent with previous issues. It's clear that one artist was working on the story in the present and another in the future. That still works well to immediately differentiate both plots. It's a refreshing way to deal with the continuity because anyone who might pick up this issue alone can find the flow easily without having read previous issues. Cover Art - 1: I hate this cover. There's no reason why a cover can't look iconic and candid at the same time. This one is posed in a hugely obvious way and all three heroes have the same facial expression (and that's a lot of teeth). Digital Cover Art - 4: Luthor looks great and manages to look almost as iconic as Superman himself, especially holding the cape. Even though I prefer the Luthor-as-a-billionaire characterization, that version can never compare to what we're seeing on this page and how powerful he is in the context of the game. I'm not sure what those things are on his back, but I assume they get used in the game somehow.